Do the colors in your game room consist of red, black, silver and white exclusively? Do you do the Dirty Bird every time the Falcons score a touchdown? 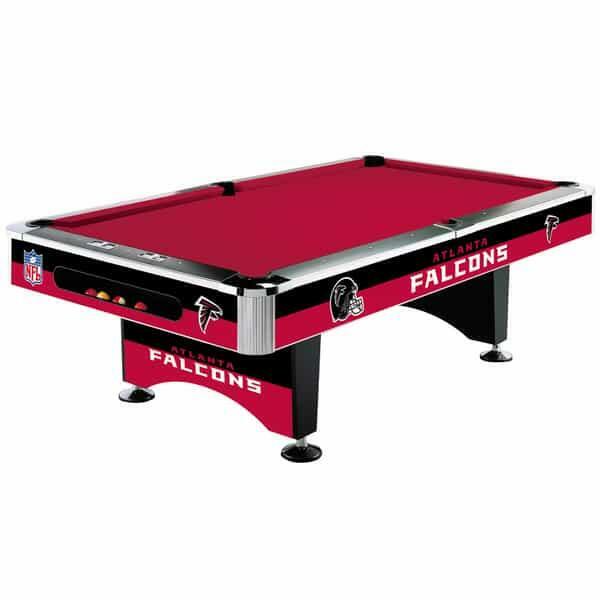 If you're the ultimate supporter of Georgia's only NFL franchise the Atlanta Falcons Pool Table from Imperial Billiards and Family Leisure is the billiards table for you. It offers the team colors and logo, officially sanctioned by the NFL and your favorite team. So quit holding onto hope that Freddie Falcon will make an appearance in your game room one of these Sundays. Provide a permanent source of entertainment any visitor to your game room will love with this Falcons-inspired billiard table from Imperial and Family Leisure! Step 1 - You will be called by a commercial freight company to set up a delivery appointment. The pool table will be delivered to a garage or carport via a semi-truck and will require a signature upon arrival. If your home does not have access for this type of freight delivery, please call for alternate options. Step 2 - You will be contacted by an installer in your area to set up a time for installation. Step 3 - The Installers will arrive and discuss with you proper placement. The pool table will then be assembled, leveled and will be "Play Ready". Step 4 - You will sign a form stating that everything is to your liking and you're good to go! Rack 'Em Up!